WHEN NATURE CALLS… GO TO MEXICO! MEXICO CITY, October 9, 2010 – Ecotourism travel in Mexico is about to get a lot more exciting in the upcoming winter months, as the country prepares for the migration of both the infamous gray whale and the incredible monarch butterfly. Starting in November, the two species will trade in the cold weather of their natural habitats for sunny Mexico, giving plenty of reason for nature lovers to do the same. Mexico is one of the only places in the world where one can enjoy the unique opportunities of getting up close and personal with curious and friendly gray whales and experiencing the unforgettable sight of a forest carpeted by millions of monarch butterflies. Why is Mexico so blessed? Because its land is a unique mosaic of ecosystems, ranging from desert in the north, to pine forests and snow-capped mountains in the middle, and tropical jungle in the south. Add to that 6,000 miles of coastline along the Caribbean, Pacific and Baja California coasts, and you could have the most varied natural landscape on the planet! Mexico’s 18 million acres of ecological preserves, 147 protected areas, dozens of biosphere reserves and national parks are home to 30,000 species of flowering plants, nearly 1,000 species of birds and more than 1,500 kinds of reptiles, mammals and amphibians, making the country a haven for nature lovers the world over. Mexico is one of the world’s five richest countries in terms of biological diversity. It has a greater variety of plants and animals than any country except Brazil, Colombia and Thailand. It is home to more reptiles than any other nation, and to the second largest number of mammals and amphibians. Some of its well-known treasures include the jaguar, quetzal bird and Kemp’s Ridley sea turtle, but Mexico also has more unique species than any place in the Americas. The country is also deeply committed to sustainable tourism practices, particularly those that deal with environmental care and support to local communities. In fact, the Mexico Tourism Board recently became a member of the newly created Global Sustainable Tourism Council, which aims to promote sustainable practices in all tourism activities. Travelers are encouraged to visit Mexico’s natural sites, as visitors can contribute significantly to the livelihood of these areas by supporting local businesses and caring for the surrounding natural areas. During the winter months, more than 10,000 California gray whales also make the trip, abandoning the freezing waters of the Bering Sea near for the warm waters of the Baja California Peninsula down the Pacific Coast. Although the whales start their migration in November, the peak time for whale-watching is January through late March or early April, after the calves are born. 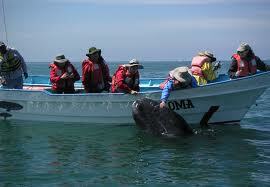 During these months, boat excursions are available all along Baja California to view these magnificent creatures. Gray whale watching takes place all along the coastline of the Baja Peninsula, but the Bahia Magdalena is one of the most popular destinations due to its proximity to the La Paz and Loreto International Airports. Lindblad’s Special Expeditions offers eight-day cruises featuring whale-watching at Magdalena Bay. Meanwhile, Baja Ecotours offers a five-day group air expedition departing from San Diego and arriving in San Ignacio Lagoon, where travelers can then enjoy the whale watching experience of a lifetime. RED Sustainable Tourism offers a conservation adventure in the Vizcaino Biosphere Reserve in Laguna San Ignacio, home of the Whale Sanctuary of Vizcaino, a UNESCO World Heritage site. During this one-of-a-kind adventure, visitors can see California gray whales up close and personal. Along with gray whales, humpback whales also migrate south during the winter from their arctic feeding grounds to breed and rear their young in the warm, protected waters of the Bahia de Banderas in Puerto Vallarta. Tours are available to view these magnificent creatures, as well as wild dolphins and a variety of other exotic sea creatures. For more information on humpback whale watching tours, please visit www.vallartawhales.com or www.vallarta-adventures.com/tours/whale-watching. In one of nature’s most spectacular phenomena, some 250 million monarch butterflies migrate annually from southern Canada and the northern United States to the Oyamel mountaintop fir forests of the central Mexican state of Michoacan and the sanctuaries of La Mesa and El Capulin in Mexico State, where they hibernate for winter and mate in the spring. Although the butterflies can be visited any time between November and March, the best time to see them is in February and early March, right before their offspring head north. The monarch butterfly sanctuaries of El Rosario and Sierra Chincua surround the mountain village of Angangueo, a 45-minute drive from Zitacuaro. Zitacuaro is two hours by bus or car from Morelia and three hours by bus or car from Mexico City. The monarch butterfly migration is so enchanting that the Monarch Butterfly Biosphere Reserve, located northwest of Mexico City, was named a UNESCO World Heritage site in 2008. Like clockwork, endangered sea turtles find their way to the tropical paradise of southern Mexico’s Pacific Coast to lay their eggs. The Pacific resort city of Huatulco, in the state of Oaxaca, is the ideal destination to view this phenomenon. Mazunte Beach is the site of the National Mexican Turtle Center, created by the Mexican government in 1991 for the protection, study and preservation of sea turtles, who were facing extinction at the time. Organized tours, like those organized by Natural Habitat Adventures, are available for eco-travelers wishing to help patrol the beach, witness these fascinating creatures laying their eggs and observe how the hatchlings quickly scurry for the safety of the ocean. The states of Michoacán and Guerrero are also popular destinations for sea turtle watching. Along with gray whale conservation efforts, RED Sustainable Tourism has several wonderful sea turtle conservation adventures as well. The first, the Magdalena Bay Sea Turtle Conservation Adventure takes place at Magdalena Bay on the Pacific Coast of the Baja California peninsula. Here, travelers can join a local group of fisher-conservationists on a journey through Magdalena Bay to participate in a sea turtle conservation project. While on the trip you will monitor sea turtles; explore islands, dunes and mangroves; bird watch and star gaze. Another RED trip is the Mazatlan Sea Turtle and Crocodile Conservation Experience where nesting sea turtles, crocodiles and old sustainable fishing techniques await. In the Verde Camacho Natural Sanctuary, one of Mexico’s premier Natural Protected areas, visitors can patrol sea turtle nesting beaches, release sea turtles, participate in beach and estuary nature walks, go on a mangrove boat tour and engage in traditional fishing. Yet another option is the Mazatlan Safari and Sea Turtle Adventure at the Verde Camacho Nature Sanctuary. This one-day safari allows visitors to release sea turtles, go on a mangrove boat tour and observe nature. The southernmost state of Chiapas is home to the Cañon del Sumidero (Sumidero Canyon) Ecotourism Park, an immense botanical garden filled with orchids, bromelias and ceiba trees, as well as crocodiles, jaguars, pumas, great curossaws, black spider monkeys and wild boars. The park also features 3,300-foot vertical stone walls carved out by the Grijalva River, which can be toured by boat or raft. Travelers are encouraged to visit www.sumidero.com or www.ecoaventuramex.com for more information. Within Chiapas’ Lacandon Jungle, one can find the villages of Naha and Metzabok, where visitors will discover blue lagoons, Mayan ceremonial sites and experience community tourism. Here, visitors can find threatened or endangered animal species such as the curassow, the harpy eagle, jaguar and quetzal. In June 2010, this natural wonder was included in UNESCO’s World Network of Biosphere Reserves. Travelers can rent canoes, participate in a guided tour or stay in an ecotourism camp during their visit. Another great eco-tourism adventure in Chiapas can be found in the Parrot’s Sinkhole (La Sima de las Cotorras). This sinkhole is located near the Selva El Ocote Biosphere Reserve and measures 160 meters across and 140 meters straight down. Here, one can admire paintings of warriors, animals, as well as a small forest at the bottom of the sinkhole housing thousands of parrots. At sunrise and sunset, the parrots enter and leave the sinkhole, an amazing marvel to witness. Camping, parrot watching, rappelling and horseback riding are popular activities at this site. Laguna Verde in the municipality of Coapilla, is a beautiful lake whose water changes color according to weather conditions at different times of the day; when it’s cloudy, the lake appears to be green, during the early morning hours it’s blue, under the sun of the early afternoon it’s silver and during a clear evening it’s ochre (a copper hue). Laguna Verde is great for hiking and a camping safari, as well as kayaking and mountain biking. Surrounded by a valley of sugar cane fields, mountains and forest are the gorgeous Chiflon Waterfalls (Cascadas del Chiflon). The most impressive waterfall is a curtain of water formed by the San Vicente river, which opens up to turquoise colored pools, ideal for swimming. A two hour drive from Tuxtla Gutierrez, the waterfalls are great for wall climbing and mountain biking. A UNESCO World Heritage site, the Sian Ka’an Biosphere Reserve is the largest protected area in the Mexican Caribbean and comprises 1.3 million acres of tropical ecosystems in the state of Quintana Roo. The Sian Ka’an Biosphere Reserve consists of lowland forest, flooded savannas, mangroves, and a portion of the world’s second largest coastal barrier reef – the Mesoamerican Barrier Reef. The Reserve is also home to 800 plant species and houses 350 bird species, as well as jaguars, pumas, ocelots, spider and howler monkeys, crocodiles and several types of turtles. In addition, the reserve also houses 23 different archaeological sites of pre-Colombian ultra. Sian Ka’an Community Tours is an organization that is deeply committed to ecologically sustainable tourism, which distinguishes them from other tour operators in the Reserve. Tour itineraries ensure personalized experiences (in small groups of course) that minimize ecological impact, tours that provide adventure and education about the challenges to conservation within the Reserve and providing genuine cultural exchanges. Sian Ka’an Community Tours offer different experiences throughout the Reserve, such as “mayaking,” a bird and natural history tour, fly fishing and a sunset boat tour. In the Mapimi Biosphere Reserve in the state of Durango, nature lovers can hike to their hearts’ content through the agave and cresote-filled landscape as well as visit the mystical Zone of Silence, where no radio wave can penetrate. The mountains, deep canyons and desert create a gorgeous setting for hiking, mountain-biking and camping. Tamaulipas State, located just south of Texas, is home to the El Cielo Biosphere Reserve, which spans 357,000 acres and includes tropical jungles and mountain forests. With elevations reaching 7,500 feet above sea level, El Cielo (“Heaven”) is appropriately named. This is an ideal location to go camping, hiking, mountain biking, or discover the diverse flora and fauna of the area. Bird watching is another popular activity to engage in while visiting El Cielo. This is a great way to explore the reserve and learn about species such as the ornate hawk-eagle, white-crowned parrot and the red-loried parrot, among others. Furthermore, El Cielo is a butterfly hotspot, allowing visitors to get up close to several different beautiful species. In the southern region of Tamaulipas, visitors can travel through Playa Miramar, an attractive beach destination which hosts several fishing tournaments throughout the year. To learn more about El Cielo, please visit http://elcielo.tamaulipas.gob.mx or http://www.elcielobiosphere.org. For those eager to learn about the flora and fauna of Mexico, the state of Veracruz, located on the Gulf Coast, is the ideal location. Boat tours are available for viewing the exotic plant and wildlife near the Laguna de Catemaco, a natural lake formed in the crater of an extinct volcano. Veracruz is also home to the Veracruz Reef System, which extends from the port of Veracruz to Punta Anton Lizardo. It consists of 17 reefs and is one of Mexico’s most important marine parks due to its abundant coral formation. The Reef System is also the habitat of diverse mollusks, as well as numerous fish and crustaceans. Covering 52,238 hectares (129,027 acres), and 132 feet (40 meters) deep, this is an ideal spot for scuba diving. Veracruz also features several other locales for nature lovers, such as Nanciyaga, an ecological reserve where one can observe turtles and crocodiles; the Special Reserve of Los Tuxtlas, a biosphere reserve whose biodiversity makes it one of the most important natural areas in the country; and “El Salto de Eyipantla,” a spectacular waterfall whose zone harbors wild boar, deer, opposums and ocelots. For more information about Veracruz, please visit http://portal.veracruz.gob.mx/portal/page?_pageid=313,4407690&_dad=portal&_schema=PORTAL. One of Mexico’s greatest natural wonders, the Copper Canyon (Las Barrancas del Cobre), is actually a series of interconnecting canyons, some them deeper than the famous Grand Canyon in Arizona. Part of the western Sierra Madre mountain range, the canyon’s terrain ranges from below sea level to more than 10,000 feet at its peaks. Because of that, the canyon features three completely different ecosystems: cold evergreen forests grace the canyon tops, warmer-weather chaparral fills the plateau on the way down and tropical desert dominates the canyon floor. Mexico’s tallest waterfall, the 984-foot Cascada de Basaseachi, is found here, along with a variety of plant life.